It's not playing in Bloomington-Normal, so we had to drive over to Champaign to see it. I don't know how long you are going to be able to hang on without seeing spoilers! You can read my last paragraph, though. It's not spoilery! I saw this last weekend, the first Woody Allen movie in a long time I've taken the trouble to see in a theater right away. And I chose right; it was just for me. 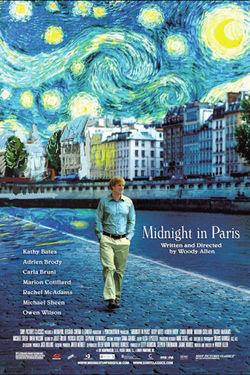 I don't have any particular Paris-longing (being more of an Anglophile), but this movie could develop some in me. Not just the period look, and the dead-on casting of the past-people, but the fantasy appeal of having all your idols from another time hang out with you and want to be your best buddies and help you with your writing... that's heady stuff. And beautifully carried out. I do wish Woody Allen could resolve his stories without putting a big explaining-it-all speech in someone's mouth near the end; but he's always done that (not in every movie, but intermittently back into the 70s). And it doesn't lessen my love for this bonbon. I'm so glad you've seen it, too, Jon, and loved it, too. I was really smitten with this movie, and I think it was mostly the mood and the beautiful way he captured the romantic longing for another time. He also hit both my hot times with the 20s and the Belle Epoque. AND I CAN'T BELIEVE STUPID BLOOMINGTON-NORMAL DOESN'T HAVE IT YET. GRRRRRR!